What little was left of the Stateside career of Samuel Fuller, the pulp conscience of American filmmaking, effectively ended with White Dog. Fuller, one of the great originals of ’50s Hollywood, made his name with genre movies—noirs, Westerns, war films—distinguished by a two-fisted style and serious moral sense. Though he became something of a hero to the French New Wave and the New Hollywood filmmakers that followed them, he was never as respected at home as he was abroad. But even that didn’t prepare Fuller for the fallout around White Dog, an unsettlingly blunt look at the intractability of American racism, framed as the story of an aspiring actress (Kristy McNichol) who adopts an all-white German shepherd that has been trained to attack black people on sight, and the animal trainer (Paul Winfield) who tries to help her. 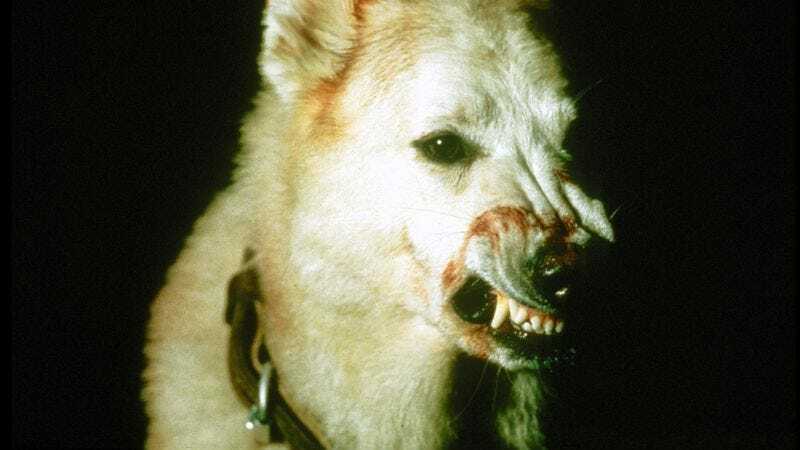 Dumped by Paramount Pictures over bad early publicity, White Dog went unreleased in the U.S. until 2008, when Criterion put it out on DVD. Dog reaction shots—which we covered yesterday as part of Pets Week—are a sort of litmus test for bona fide filmmaking chops, being so intrinsically corny that it usually takes a great filmmaker to do them right. Fuller turns close-ups of the dog’s face—its white fur making its snarl seem even more like a graphical symbol—into the kind of blunt image that only gets more and more potent through repetition. And in the trainer, Keys, he finds a figure of nearly self-destructive frustration, whose attempts to re-train the dog become a metaphor for the question of whether the legacy of racism can ever really be undone. Movies about relationships between dogs and humans are almost always founded on mutual sympathy; here, it’s subverted into mutual fear, with Keys as just one man, but the dog as an idea. Boosted by a gloomy Ennio Morricone score and the kind of off-kilter details that always defined Fuller’s style, White Dog remains sobering and, at times, troubling—Fuller’s last great film, before a final decade spent making baroque pulp pastiches and TV movies on French money. Availability: White Dog is available on Criterion Blu-ray and DVD from Netflix or possibly your local video store/library. It can also be rented or purchased digitally through Amazon, iTunes, and Google Play.